Oh my gosh John, come home and meet my mum! What a clean cut boy you are, Brian would be so proud!! This, of course, is the Boys with Mersey Beat founder and editor Bill Harry and road manager Neil Aspinall. It was taken on Wednesday, August 14, 1963 at the Granada TV Centre in Manchester following their appearance on Granada Television’s "Scene at 6:30". The group had driven from Liverpool to record two performances. The first performance (“Twist and Shout”) was broadcast that same evening and the second performance (“She Loves You”, their latest release) aired the following Monday. 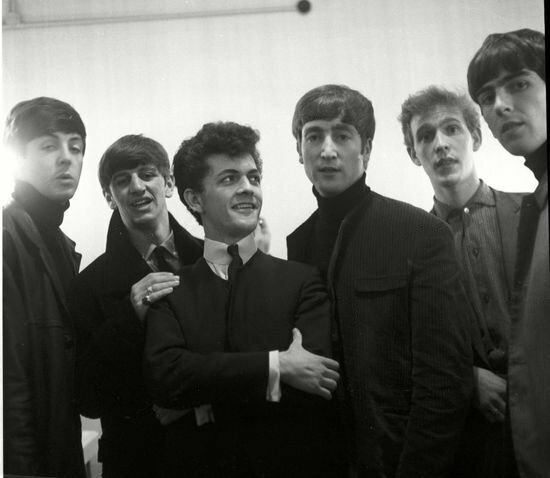 On the program, Bill Harry discussed Mersey Beat and the early career of the Beatles. That's why he was there.